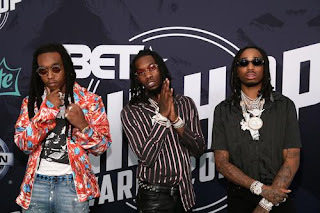 Home » celebritynews » entertainment » Migos Sued For Ripping Off "Walk It Talk It"
Migos Sued For Ripping Off "Walk It Talk It"
Since coming up, the Migos have released plenty of iconic songs. "Versace," "T-Shirt," "Bad And Boujee," "Stir Fry" and others immediately come to mind. Another of their more popular tracks is "Walk It Talk It," which was released as part of their Culture II album this year. The song has been given one of the better videos of the entire year and although people around the country are still bumping it in their playlists, it turns out the trio may have been influenced by an outside source to create their version of the hit. According to TMZ, the Atlanta rap group is being sued by Leander C. Pickett, who performs as M.O.S. or DJ Folk, for ripping off a song he released ten years ago. The information presented in the lawsuit seemingly points to the Migos' version being more of a cover than an original song as the choruses are nearly identical. M.O.S. released "Walk It Like I Talk It" in 2008 on a mixtape after recording it the year prior and when listening to both tracks, you can't deny the similarities. Pickett says he realized in January 2018 that the Migos had a song with an extremely similar title before listening and realizing they had used a "substantial portion" of his version. Pickett has filed a lawsuit against Migos and Capitol Records, asking for money since he believes they stole one of his works. According to the publication, he filed for a copyright on his version after Migos had released "Walk It Talk It" in March 2018. We'll keep you posted on any updates.